Russia's deputy foreign minister has said Britain's expulsion of four diplomats from London could jeopardise co-operation on counter-terrorism. Alexander Grushko said the move - a response to the Alexander Litvinenko murder row - would complicate "vitally important" security issues. He added: "We are being punished for observing our own constitution." The Foreign Office said it had set out its position adding: "No retaliation on Russia's behalf is justified." A full statement is expected from Moscow, which has warned Britain to expect "serious consequences". The expulsion of four diplomats follows Moscow's refusal to hand over former KGB agent Andrei Lugovoi, who is accused of murdering Mr Litvinenko in London last year. Mr Lugovoi denies involvement. Mr Grushko said London had said it would not maintain contacts with Russia's Federal Security Service - also that the UK was prepared to co-operate on counter-terrorism. "These are mutually exclusive statements taking into account the central role the federal security service takes in fighting terrorism both internationally and domestically," said Mr Grushko. "It is obvious that the policy which is being pursued by Britain is going to complicate the terrorist, the security issues, which are vitally relevant and important for Britain and Russia and the wider world." He also said the visa measures announcements would make things difficult for ordinary Russians - the UK has said they would only affect government-sponsored visas, not those of ordinary Russians. Analysis: Will the spat widen? Asked why there was not yet any formal response, the Russian ambassador to Britain, Yuri Fedotov, said: "It takes time, we are serious people, we are not rushing." He later told the BBC it was "hard to be optimistic" about the state of British-Russian relations. "I hope in the long run our relations will be restored but [this] is not the best moment in the history of our bilateral relations," he added. Prime Minister Gordon Brown's official spokesman said he had not yet received a formal response from Moscow, but when he did it would be "considered carefully". Speaking on BBC2's Newsnight, Boris Berezovsky, a London-based Russian dissident, urged Mr Lugovoi to submit himself for trial in a third country like Germany, Denmark or Norway. Mr Berezovsky added: "Maybe the Russian constitution is against [extradition] but Lugovoi personally, if he wants to clear the situation, he is able to travel anywhere he wants if he feels he is not guilty." 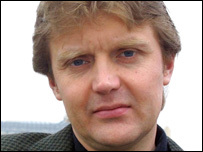 Mr Litvinenko, another former KGB agent, died of exposure to radioactive polonium-210 in London in November 2006. The radioactive isotope used to poison him was found in several places that Mr Lugovoi had visited in London. But Mr Lugovoi told Russian television that the outcome of the inquiry had been predetermined. He said: "The British authorities have in effect emphasised yet again that the Litvinenko case actually has a political subtext." Under the European Convention on Extradition 1957, Russia has the right to refuse the extradition of a citizen. The UK has the right to request Mr Lugovoi be tried in Russia, but the UK's director of public prosecutions, Sir Ken Macdonald, has already turned down the offer. The UK's director of public prosecutions has recommended Mr Lugovoi be tried for murder by "deliberate poisoning".